Ballymaloe Mint Jelly for sale. Buy online at Zingerman's Mail Order. Gourmet Gifts. Food Gifts. Let's face it: most mint jelly is pretty unpleasant stuff. It's wobbly and flourescent green and it tastes more chemical-y than minty. If you've spent a lifetime shoving it to the side of the plate and hoping nobody notices, you're not alone. 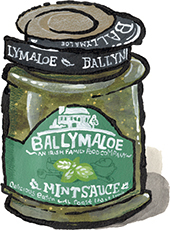 I thought that's how all mint jelly was until I tasted this one from Ballymaloe in Ireland. Made with mint from their own garden and simple ingredients like sugar, apple juice, and white wine vinegar, the mint jelly from Ballymaloe is a bit tart, a bit sweet, and tastes, amazingly, like mint fresh from the garden. Tasting it for the first time was a revelation for me: not only could mint jelly be sort of okay, it could be really, really good. An outstanding accompaniment for roast lamb or game.